Once the dancing was over, the bags were wheeled into the four star hotel room, and the heels and neckties were off, the only thing we could think about (except for sleeping after darn near 13 straight hours of wedding) was the five day, four night honeymoon we were to embark on the following day. After eleven months of arduous wedding planning and us working a total of four jobs to foot the total wedding and honeymoon bill, it almost goes without saying that we couldn't wait to get away. 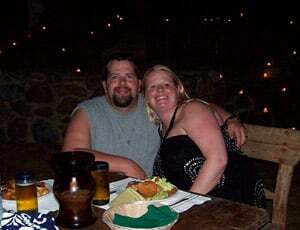 In addition, over our seven year relationship pre-marriage we had never been on a vacation together before, short of a brief road trip, so the honeymoon had to be perfect for our first time out. We chose Puerto Vallarta, Mexico because we wanted to go somewhere tropical and affordable all at the same time. Since we got married on November 1st our honeymoon was smack dab in the middle of the Atlantic hurricane season and Cancun, while lovely, has been hit by hurricanes in the past so it seemed too risky a choice for our honeymoon. We wanted everything to be completely stress-free so we also decided before we even searched for accommodations that we wanted an all-inclusive so we wouldn't have to manage money short of excursions and shopping. I researched tirelessly on every review site you can think of trying to find a good all-inclusive. We knew we didn't want buffets and wristbands and all that contrived "entertainment" but just a smaller resort with good service and food. 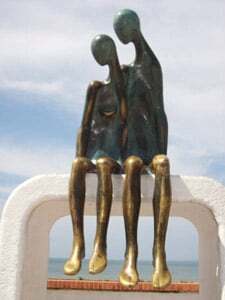 I found Villa Premiere Resort and Spa on Trip Advisor ranked as the #2 resort in Puerto Vallarta. I read every review available and knew I had found the place. We could not have been happier with the resort. We found the retreat we had been waiting for in the 83 room resort with all ocean views and the best service and food we could have imagined. The minute we stepped into the lobby we were at ease. While we sipped our champagne and had a complimentary ten-minute massage, our room was personalized with our choice of aromatherapy and pillows. The room was beautiful and exactly as we had anxiously anticipated. We acted like children marveling at how "cool" everything was. It was such a relief to finally be there. That first night we got a couple of beers and went down to the beach and those pictures we candidly snapped of each other on the shore are the ones I cherish the most. You can see the relief and joy in our faces. Our room had a wrought iron balcony facing the ocean that we sat on many times each day and night with Pacifico beer or glass of wine in hand. We observed the sunset every evening giving off its gorgeous saffron light and listened to the waves crash on the beach a mere stone's throw from our hotel. Those sights and sounds kept us absorbed in the honeymoon state of mind for every minute of our trip. We took two excursions during our time in PV. One consisted of a boat ride out on the ocean to a private island for a dinner on the beach, the other riding ATVs up the Sierra Madre Mountains. 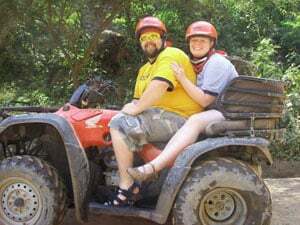 While both trips were fun and well worth the money, we loved the ATV ride and couldn't have picked a more fitting thing for us to do. My husband drove and I held on in back. We splashed through creeks and splattered through mud, got filthy and wet, but we'd do it all over again in a second. The tour's highlight was a stop for swimming and beverages at a beautiful waterfall and tiki bar halfway up the mountains. During our trip we tasted twenty flavors of tequila and bargained at flea markets, walked around sight-seeing and enjoyed the city art, but we truly found ourselves most pleased with the time we spent just slowing down, eating breakfast, lunch, and dinner with the ocean waves crashing twenty feet away, floating around in the pool, or bellying up to the bar for a nightcap (or three). In those small moments together we found ourselves again finally away from the wedding madness and the daily grind. Our trip was as well planned as we could make it and I comparison priced for weeks trying to get the best deal. When it was all over on November 6th, and we were back in the cold Missouri almost-winter, our honeymoon probably totaled about $3000.00, the costs of which were partially defrayed by our Traveler's Joy honeymoon registry. I did a great deal of research trying to find the right honeymoon registry for us and this seemed the perfect fit. I got compliments from everyone who checked it out and it was so much fun for us to see our gifts coming in. We would recommend PV and especially Villa Premiere to anyone wanting an affordable and fun tropical honeymoon. It turned out to be a wonderful choice for us and we haven't stopped thinking about it since we boarded the plane to come home.